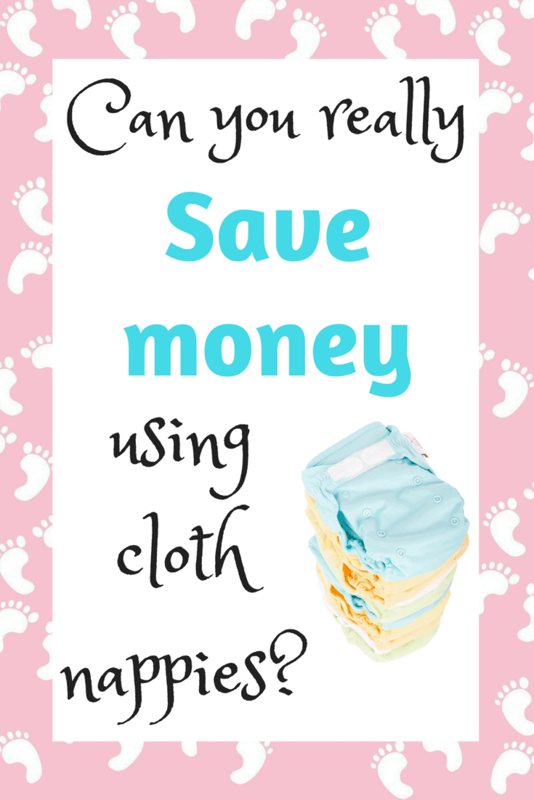 Leave a Comment on GUEST POST by Miss Manypennies: Can you really save money using cloth nappies? Today I’m thrilled to have a guest post from Hayley at Miss Manypennies talking about using cloth nappies. This is a topic close to my heart as we used cloth nappies with my daughter who has recently potty trained, but we still seem to be very much in the minority of users in the UK. Reusable nappies – How much can you save? The average child is estimated to use around 4000 nappies! This means that for each baby who wears nappies for 2 years (and that’s being conservative – my little girl potty trained at 3) the average amount spent on disposable nappies is about £800. I totally get that. And if it’s not for you, that is completely fine. BUT, cloth nappies have evolved a LOT since then. They are much easier to use and clean, plus they look lovely and come in all kinds of colours and designs. If you really like to save money, using cloth nappies could potentially save you hundreds of pounds. And if you use the same nappies for subsequent children you can save the entire amount you would have spent on nappies for the second child onwards! Cloth nappies are not cheap. It’s easy to look at the expense of the initial outlay to buy them and be put off. But we are looking at the long term saving here. Sure, it might seem cheaper to stick a £10 pack of Pampers in the trolley than to spend £200 on a cloth nappy kit, but in the long run, you could end up spending much more. If you buy reusable nappies, it should take less than a year to make back in savings what you spend initially, so it’s a great investment. For this we’ll go with a baby being in nappies until around 2 and a half years old. Obviously, they don’t all potty train at the same age, but that’s a pretty normal age to start thinking about potty training. My first daughter was just over 3 when we stopped needing nappies. My second is 2 and a half and I think we’ll probably start giving potty training a go soon. Let’s say you only ever use supermarket own brand nappies, at an average cost (it varies with the size of nappy) of 7p per nappy. Assuming you get through 7 nappies a day (probably slightly more for a new-born, but less for a toddler) these will set you back £445. Say you don’t get on with own brand nappies and you want to use a more expensive brand such as Pampers. Taking an average cost of 18p per nappy, with the same conditions as before – 7 per day for 2.5 years – this is now going to cost you £1146. Ouch. A full set of cloth nappies for full time use will probably cost you around £250, although you could spend more or much less depending on which types you go for. As an example, this set available from Amazon contains all you should need from birth to potty and currently costs under £160 . You’ll need about 20-30 nappies and a nappy bucket or wet bags to store once used. You also need to factor in a cost of about £1 a week for washing. So, let’s assume a total cost of around £380 for 2.5 years of reusable nappies. Comparing this first to the cost of supermarket own brand nappies, the saving is only £65 – which, while still a saving, is not actually a huge amount over the course of 2 and half years. However, compared to the cost of buying branded nappies such as Pampers, the saving is £766 – a much more significant saving! In both cases the saving will be much higher if you reuse the nappies for any further children. How do cloth nappies work? Cloth nappies are made from absorbent materials such as bamboo or microfibre. Most are now shaped the same way as disposable nappies with either Velcro fastenings or poppers. You can either use all in one or a two-part system involving cloth nappies with a waterproof wrap to cover it. I’ve used both kinds; I prefer all in one’s especially for ease of use in the day time, but I did use bamboo lollipop nappies with wraps at night time when my little girl was very young. You also use liners inside the nappy, which draw the wee away from baby’s bum to keep it dry. Some nappies are okay to be tumble dried but hanging out in the sun is great for getting rid of any stains. You can often buy reusable nappies in the supermarkets now, as well as places like Boots and Mothercare. There are also loads of online retailers and it’s always worth shopping around or waiting for a sale/special event to grab a bargain. Aside from saving your pennies and the environment (well a little bit of landfill at least) another great bonus to using cloth nappies is that you can sell them on after! (You can’t say that for disposables!) You can sell on eBay, or there are tons of Facebook groups dedicated to buying and selling cloth nappies. Some people even like to collect specific designs! I’d estimate that you’re likely to be able to recoup at least a third of your costs if not more if you keep them in good condition. Even compared to cheaper brand nappies, you save a little money. If you would have used premium nappies, it’s significantly less expensive to use cloth. If you keep your nappies and use them again for subsequent children, your saving increases to nearer £1000. You can sell them on afterwards and regain some of your initial investment. Previous post: Do you need an everyday emergency fund?